After a young Chinese prostitute is stabbed to death by her rich American client, the tabloids dub Dandan Yee "Lethal Beauty"-despite the fact that she was the one who ended up dead. Yet even with double standards and naked prejudice working against her, Seattle prosecutor Mia Quinn is determined to get justice for Dandan Yee. But when a key witness goes missing and an unsavory juror shuts down deliberations without explanation, Mia fears the trial-and the law-are being tampered with. A constellation of fresh killings has Mia and homicide detective Charlie Carlson searching for a common source and puts Mia's family in the crosshairs of a Chinese crime cabal. Meanwhile, Dandan Yee's mother has opted to take matters into her own hands ... and the stakes get more lethal overnight. In the midst of all this, Mia has to contend with a fifteen-year-old son who is growing up too fast for his own good, and the idea that Charlie might want to be more than just friends. Can Mia and Charlie stop the murders and still keep her family safe? Or is the very act of seeking justice enough to cost her everything-and everyone-she loves? 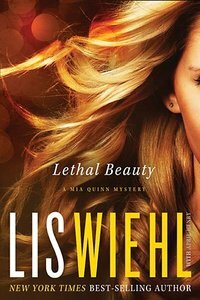 About "Lethal Beauty (#03 in Mia Quinn Mystery Series)"
Lis Wiehl is one of the nation's most prominent trial lawyers and highly regarded commentators. The author of Winning Every Time, she is also the legal analyst on the Fox News Channel and Bill O'Reilly's co-host and sparring partner on Radio Factor. A graduate of Harvard Law, Wiehl has never lost a case. She lives with her husband and two children in Westchester County, New York. <P>"From the Hardcover edition." Customer Reviews For "Lethal Beauty (#03 in Mia Quinn Mystery Series)"
After reading the first book in this series, A Matter of Trust, I just had to read this book, the second in the series. Mia, the main character has a lot on her plate - her caseload from work, questions about her husband's death and the struggles of being a single working mum. I just love her character - she's real, down to earth and doesn't have it all together. I enjoyed reading this book - it had enough suspense to keep me intrigued all the way through. I finished reading this audio book in the past week, and thoroughly enjoyed it. The narrator was superb, managing to keep me engaged throughout the story. I felt like i was right there in the midst of the situation and the writing was excellent. I recommend this book for fans of suspense who don't want too much of a preachy feel to their fiction. You will love the main character Mia. Great read and love that her characters are real and normal. Enjoy! Order now to secure your copy when our stock arrives. Other edition is available. 9780718077655 0 Available. Expected to ship in 7 to 8 weeks from Australia.